I try to keep this updated, but if you see any discrepancies, please let me know! Below are my favorites and I'm sure you have some, as well! Let me know and I'll check them out! 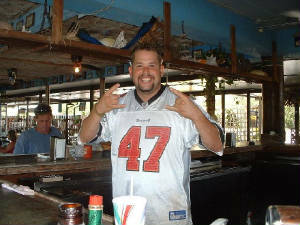 Mike, your bartender at Alabama Jacks! On the way in or just coming out of the Keys in Florida City.......fresh fish to eat in the restaurant or take it home and cook it yourself.....The Captains Restaurant and Seafood Market. Some of the best fried Yellow Tail Snapper I've had!Brought home some Stone Crabs, Yellow Tail Snapper and Hogfish to cook on the grill. They also had some nice looking Tuna and a couple varieties of Grouper. Just as you are leaving Homestead/Florida City US1, on the right hand side, in front of the Best Western. You won't be disapponted. 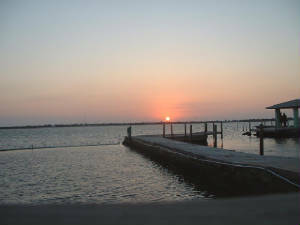 All Florida Key’s road trips should start as soon as you leave Florida City. Take a left on to Card Sound Road, also known as the Toll Road. If you passed Jack’s Last Chance Saloon, then you have missed the turn. Follow Card Sound Road for approximately twelve miles and Alabama Jack’s is on your right hand side before the toll bridge. This place has been here for eons and was made popular by Jimmy Buffet when he stopped by on his hitch hike to the Keys. Alabama Jack’s is a great rest stop (we’ve been traveling three hours already) for a pee, a few cold beers and the BEST Conch (pronounced ‘konk’) Fritter’s in the Keys. Feed the leftovers to the assorted fish that hang out by this open air bar on the water. The smoked fish spread and the smoked fish tid-bits are worth a try (today the fish was Wahoo). Mom’s homemade Key Lime Pie is one of the best I’ve ever had, too. If you were bored when you got here, the ambience, the laid back attitude and the antics of Mike, the bartender, will get you in a better frame of mind in no time. By the way, AJ's now has a "Full Liquor" bar along with their wine and cold beer. Unfortunately I have to report the demise of Steve's Time Out BBQ and Papa Joe's, both of which were on my 'favorites list'. I guess it's the sign of the times. I really hate to bash places, but in this case I don't want you to make the same mistake we did.....stay away from Whale Harbor. So-so food and bad service is not a good combination. The Green Turtle has been renovated and is now open again. I'll check it out on my next trip down. I also noticed an interesting looking Tiki Bar just north of Hog Heaven that bears checking out soon! Porky’s Bayside BBQ, in Marathon, is another favorite stop. Look for it on the right just as you are leaving Marathon, and if you see the 7 Mile Grille, turn around and go back a few hundred yards. Porky’s is small, but a gourmet treat awaits you for their authentic Cuban style bbq’ed Pork Mojito Sandwich. Top that off with their unique Deep Fried Key Lime Pie. If you stick around at sunset, sign up for their FREE Sunset Cruise (space is limited) on the Gulf. It had been suggested that we visit the Quarter Deck Lounge in Key Colony Beach (Marathon). Map and Internet directions were useless on the way down...tried twice and still couldn't find it. Coming back to the mainland we finall y found it. However, on a Saturday, in the middle of tourist season, at 11:00 AM, a sign proudly announced "Closed Today". Okay, nuff said about that. Just noticed that just a few hundred feet west of the 7 Mile Grill is a new place called Rum Bums that looked interesting from the road! Went by it before we realized it was a bar, but it will be checked out. You can’t go past Big Pine Key (watch your speed!) without a stop at The No Name Pub. This great little place is off the main road on Watson Blvd, and you may have to ask several times to find it! Once there, if there is room left inside, you will have to try one of their great homemade pizza’s, in assorted varieties. The Grouper Sandwich is also a local favorite. I just made a fantastic discovery; the No Name has one of the best Grilled Cuban Sandwiches that I’ve ever had the pleasure of eating! No kidding. Take a trip down Key Deer Blvd while there and maybe you can see one of the many little Key deer that hang around the Lion’s Club. Be careful driving, these little critters ARE protected and can be found just about any where in Big Pine. It’s also against the law to feed them! Did I mention to watch your speed going through?? The speed limit 45 mph during the day and 35 mph at night. It IS strictly enforced, by the way. If you’ve had enough driving by now, and don’t feel like going the rest of the way to Key West, I suggest strongly that you stop at Parmer’s Resort on Little Torch Key (as you leave Big Pine and go over the bridge, turn right onto Barry Ave). Parmer’s is situated on five tropically landscaped acres and offers motel rooms, efficiencies w/full kitchens and 1 or 2 bedroom suites. They have a pool, boat dockage, a generous continental breakfast, plus many other amenities. Parmer’s is about ½ mile from US1, so it is extremely quiet. Grab a book, a beer and relax in one of the many hammocks and lounge chairs available. Several charcoal barbecue grills are available for use. Go ahead, cook that fish you caught off the dock! The staff and employees of Parmer’s make your stay an enjoyable one. Stay a night, stay a few days, stay a week, you won’t be disappointed. We took our "Mini" Big Green Egg with us the last trip and bbq'ed on the seawall, right outside our room. Magnificent! Parmer's has recently renovated and expanded their property, so click on their link (towards the bottom of the page) and check out their new 'Presidential Suite' and the 'Lagoon'. Down the road, on Ramrod Key, you’ll find Boondocks Bar & Drafthouse. A great place to stop for a light lunch and few beers. Check out the outside patio while there. I especially like the homemade chili and the All Beef Black Angus ¼ pound hot dogs that are offered here. Dinner is served daily and I suggest you try the Lump Crab and Asparagus Soup for an appetizer, their house specialty. On a recent night I enjoyed a grilled Flat Iron Steak encrusted with crab meat and topped with a red pepper aioli sauce...interesting and delicious! This place is fairly new, but the locals have embraced it. They have added a real minature golf course to the property, the 'ONLY" one in the Keys, I might add! New to this road trip is The Square Grouper at MM22.5 at Cudjoe Key. Not so much BBQ, except maybe for the smoked Morroccan Lamb Ribs, but the fresh fish and wine list is out of this world. I would have to rate their homemade Peanut Butter and Chocolate Pie as the "BEST" I've ever had....anywhere!! Open for lunch and dinner, Tues thru Sun, and a reservation for dinner might not be a bad idea. Just before entering Key West is Stock Island. Stock Island holds one of the best kept secrets in the lower Keys…..The Rusty Anchor restaurant. They serve great, fresh seafood, six days a week. If you can’t find the Rusty Anchor, just ask a local, they’ll point you in the right direction. The Yellowtail Snapper is the 2nd Best in the Keys. A trip to Key West is not complete without a visit to the Green Parrot Bar and the adjoining Meteor Smoke House. Good drinks and fun at the Green Parrot, while you’ll find the best ‘southern most’ bbq in the United States at the Meteor. You can eat inside or at the outside bar, complete with its own ‘misting’ system to keep you cool. I realize there are lots of places in the Keys that I’ve missed, this compilation is my personal favorites at this writing (March/09). If you felt I missed a good place to visit, or incorrect information has been given, or you want me to check out your place, please feel free to email me here. Food Reference - History, Facts, Quotes, Events, Recipes and lotsa links to just about any thing related to food! Don't forget to order your copy of the new "Addicted To BBQ" cook book!